Recognized by BBC Radio as “One of the most brilliant world-fusion producers of our time,” Los Angeles-based electronic music producer David Starfire returns with his highly anticipated benefit album Karuna, released on Tuesday, March 1, 2016 available on Bandcamp, iTunes, Beatport, Amazon, Spotify, Apple Music and all digital music stores. 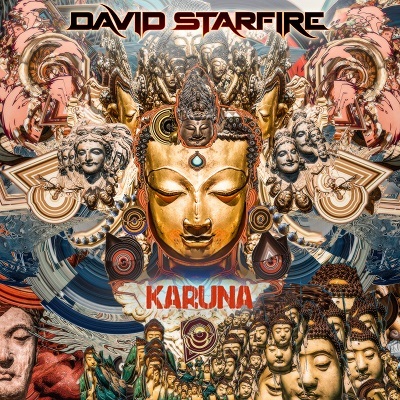 Karuna is David Starfire’s fifth album and features the first time visionary artist Alex Grey has allowed his voice to be used in a song in addition to collaborations with William Close and The Earth Harp, Govinda, and several other world-renowned artists. The album was also David’s first Kickstarter-funded charity focused release, which enabled him to become the premiere electronic artist to collaborate with Burmese musicians on an entire album while visiting refugee border zones in Northern Thailand during a time of political unrest in 2015. The album title translates to ‘Compassion’ from Sanskrit and its ethos lives up to the name with all the album’s proceeds going directly to the Thai Freedom House – a non-profit organization located in Chiang Mai devoted to educating Burmese refugees through language, arts and academic programs. Karuna boasts a soundscape rich with multiple layers of contrast, from the integration of Eastern and Western scales, to the juxtaposition of native and modern instruments. Incorporating glitched violins, delayed xylophone, gamelan, homemade harps, buffalo horn flutes, and Burmese vocals, this album proudly displays the complexity and versatility of Burmese musicianship layered against the texture of booming bass lines and seductive synths. “The One” features Alex Grey, the legendary visionary artist and philosopher, who recites an excerpt from his book Art Psalms, alongside the shamanic flute of Joaqopelli. During his visit in the Burmese refugee town of Mae Sot, Starfire recorded with harp player and social activist Doo Plout, featured on the track “Tenaku” alongside composition from William Close and The Earth Harp Collective, world-renowned musician and installation artist who turns architecture into instruments. “Y’wa” features the voice of Chi Suwichan, a prominent Karen social activist and harp player who travels the globe promoting the cause of his people through music. Karuna also features collaborations with Burmese stroh violinist Len Pong, vocalist Gonlao, and temple drummers from Wat Pa Pao and Wat Tung Salee in addition to electronic artist/violinist Govinda, violinist HÄANA, hammer dulcimer player Jamie Janover, vocalist Oriel Poole, and more as well as stunning cover art from esteemed digital painter Android Jones. To commemorate the release of Karuna, David Starfire will descend on Los Angeles for an album release party at Santa Monica’s Zanzibar on Wednesday, March 2nd 2016. Hosted by The Luminous Movement, the evening features sonically salacious supporting sets from Rhythmstar, Imagika Om and Electric Dandelion. RSVP to David Starfire’s Los Angeles Karuna Album Release Party here. Starfire will be devoting2016 to touring in support of the album, including an album release party in Toronto on Friday, March 5th, as well as performances on the festival circuit, beginning with Tree Fort Festival and Lightning in a Bottle. David Starfire’s library of 5 albums, 6 EP’sand dozens of remixes proudly displays the fusion of indigenous music with modern, electronic production methods, and an ethereal blend of bass-heavy beats expertly mixed with world melodies. Over the years, his performances have landed him in esteemed locations, from Coachella and Shambhala to the Pyramids of Giza. He has collaborated with a wide range of revered artists, from Ooah of Glitch Mob fame, Afrika Bambaataa, Natacha Atlas and more. His side projects include The Dub Kirtan All Stars with music producer FreQ Nasty and the other is Star-Culture with renowned visual artist VJ Culture.